Computer simulation played the Astros vs. Royals series 501 times to predict the outcome. It’s the defending AL champs against the most inexperienced, but exciting, playoff team. Kansas City was one swing away from defeating the San Francisco Giants in Game 7 of the World Series last season. 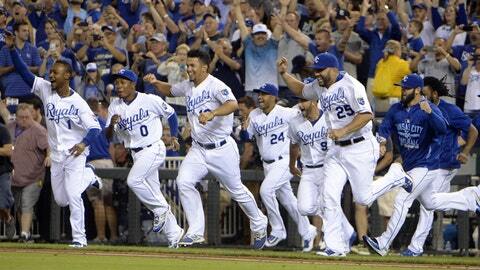 Now, the Royals return to the postseason with the hopes of winning their final game. Houston dominated the Yankees in the Wild Card round and continue to exceed expectations. Remember, Sports Illustrated tabbed the Astros as the World Series champs…for 2017. Due to the survive-and-advance one-game playoff format, Houston’s ace, Dallas Keuchel, won’t start until likely Game 3. That means Collin McHugh gets the nod in Game 1 against Kansas City’s Yordano Ventura. We’ll start with Ventura. Last year, he made four starts in the playoffs. The Royals won each of those games. In three of the four outings, Ventura held the opposing team to two earned runs or less. More recently, Ventura has allowed only one earned run in his last 15 innings of work. For Game 2, Johnny Cueto will try to prove to that he is worth the investment. The Royals sent three young left-handed pitchers to Cincinnati for the one-season rental. Since joining Kansas City, Cueto has allowed five earned runs or more in four of 13 appearances. In fact, this year, Cueto is 3-4 with a 4.40 ERA in seven starts at Kauffman Stadium. Another former Red, Edinson Volquez, gets the ball in Game 3. Last year, Volquez earned the start for Pittsburgh in the Wild Card game and ultimately lost to San Francisco. Though he only allowed five hits, the Giants were able to capitalize on those opportunities and score five runs on Volquez. In the other dugout, McHugh will open the series on the road. This season, he was 12-3 (3.73 ERA) at home and only 7-4 (4.05 ERA) away from Minute Maid Park. Scott Kazmir is slated to start Game 2. Like McHugh, Kazmir was a better pitcher at home. In 2015, he was 5-4 with a 2.61 ERA in 96.2 innings of work at home and 2-7 (3.65 ERA) on the road. With pitching coming at a premium in the postseason, Houston might be down 2-0 going into Game 3. Luckily, that’s when Keuchel returns to the hill. McHugh and Kazmir might have been good at home, but Keuchel was dominant. In 18 starts (129.1 innings), Keuchel was 15-0 with a 1.46 ERA at Houston. Both of these teams play extraordinarily well in front of the home crowd. This season, Kansas City was 51-30 at Kauffman Stadium. The Astros were 53-28 in their park. We could see this series go the distance with Game 5 determining the winner…in Kansas City on October 14th. If the simulation holds true, this series will go the distance. Kansas City won 51.5 percent of of the time, with a five-game victory the most common outcome (occurred in 24.8 of series). In simulations in which the Astros prevail, they most often win the series in four games (occurred 22.6 percent of the time). For Kansas City, it was a group effort offensively in the simulation. Lorenzo Cain led the Royals in batting average (.317), Salvador Perez and Kendrys Morales topped the team in home runs (0.67 and 0.66 per series, respectively) and Eric Hosmer collected the most RBI (3.0 per series). If the Astros were able to give Keuchel more than one start, the series would likely tilt in their favor. He was the best starting pitcher in the simulation for either team. Keuchel averaged 0.5 wins per series with a 3.47 ERA. For more MLB playoff predictions, view our Rangers vs. Blue Jays, Cubs vs. Cardinals or Mets vs. Dodgers simulations.